“Consumer reviews are significantly more trusted — nearly 12 times more — than descriptions that come from manufacturers.” A 2010 report from eMarketer highlighted the importance of consumer reviews in their pre-purchase decision making process. Consumers have not only increased the amount of time that they have spent reading reviews, but they have increased the amount of them that they read as well. Given their importance and the importance of trust involved in the digital industry, it is important as an agency to manage our online reputation through validated, reviews. Onit was recently featured in a press release by Clutch, the leading B2B ratings and review platform, that highlighted them as a top New York City, software, php, web developer and as a top NYC web designer. To rank us, Clutch relies upon three main factors in their research, market presence, clients & experience, and most importantly, analyst-led reviews. They take the time to hold interviews with our clients to ensure unbiased, validated reviews that third-party buyers of our services can use to inform them along their buyer’s journey. The combination of these scores are formulated into a leader’s matrix. 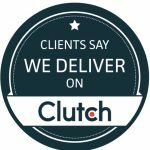 Considering the importance of reviews in the development space, we happy to have 7 reviews on Clutch’s site. These Clutch analyst-led reviews help validate our tremendous work for our clients because they are unbiased and provide real feedback on the services that we provide. Below is a sample of case studies and 5-star reviews that our clients have left for us with Clutch. A California based university needed an upgrade to their standard HTML site. It wasn’t mobile friendly and needed constant maintenance. We were brought in the address this, and build an autonomous, mobile responsive site that allows them to independently install updates. Additionally, to help the university gain exposure, we provided SEO services to help them get found for education related keywords. The impact of our work resulted in a 10x ROI, the client mentioned “Investing $1,000 in Onit Digital is worth $10,000 to our company,”. Our speed and ability to rapidly isolate and resolve problems shined in this engagement as well, as we were more than happy to accommodate our partners budget. Our belief in partnering and growing with our clients has resulted in three separate engagements and a strong ongoing collaboration. Here at Onit, we are a premiere provider of digital solutions, and we are thrilled to be recognized for our talents in this NYC press release.